If you enjoy crafting, you know how easy it is to keep accumulating more (and more) materials and tools, until your stash is bursting at the seams. 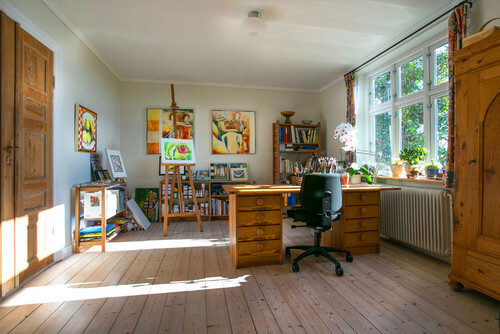 To rein in the clutter — without quashing your creative spirit — consider taking a more minimal approach to your artistic space. 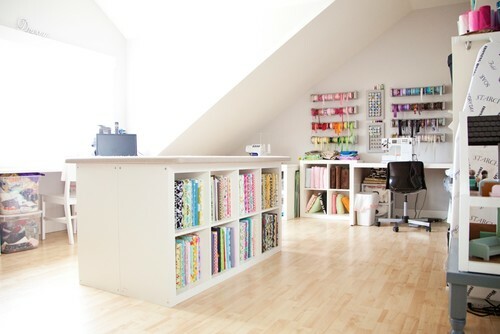 Here are 10 ways to reduce your stash and organize your craft space simply and beautifully. 1. Try before you buy. As a creative person, you’ve likely explored many types of art media and crafting skills over the years. Exploration and curiosity are wonderful, worthy pursuits — but that doesn’t mean you need to go all-in when it comes to purchasing materials and tools for every new craft that comes along. If you’re interested in something that falls outside your usual metier, try taking a workshop to learn more before you invest your time, space and money in it. Attending a class or workshop is a wonderful way to get to know your local craft community, learn a new skill from experienced crafters, and figure out whether you really love it before plunking down cash on a big investment like a sewing machine. 2. Share extra supplies. On the other end of the spectrum, if you are already a well-established crafter with a huge stash of materials, you may be in the position to share some of that wealth with a new crafter. Joining a local crafting group, or attending open hours at a local yarn or fabric shop, is a great way to meet newbies who may be grateful to receive your extra tools and materials. 3. Be sure every tool has a purpose. Aim for every tool in your toolbox to have a clear purpose, while avoiding unnecessary duplicates. 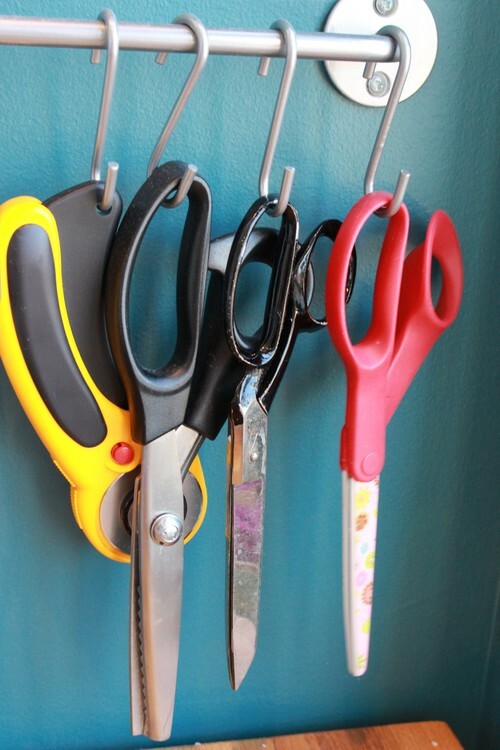 Among your cutting tools, for example, you may have one pair of scissors for paper, another for cloth, plus a rotary cutter — but four pairs of identical scissors would be overkill. To keep your tools streamlined, make a habit of periodically sorting through them, and weeding out duplicates and unneeded items (donate these to a local art teacher or charity). 4. Set a limit on inspiration-gathering. Collecting pretty paper, art cards, fabric swatches and magazine tear sheets can provide a rich source of inspiration for your creative projects. But when your inspiration files are bursting at the seams, it can be more overwhelming than inspiring. If you’ve been stuffing snippets of inspiration into boxes, files or piles, consider a different method. 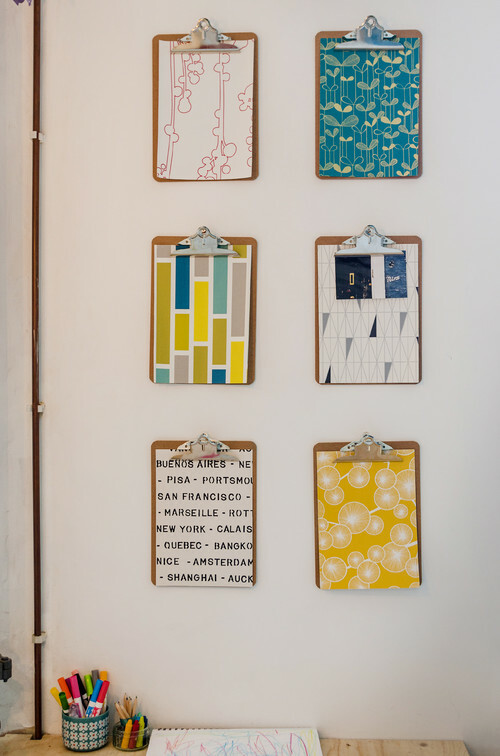 What about hanging a series of clipboards on the wall? Or a big bulletin board? Whatever method you choose, edit your inspiration regularly so that it remains a source of fuel for your creative ventures, not a source of stress. 5. Keep your most-used materials neat and within reach. Take a moment to list the materials and tools you use most often — these should be clearly visible and within reach of your workspace. Desktop or wall organizers are ideal for your everyday essentials. On a budget? Recycled glass jars work well, and you can personalize them with paint, crocheted cozies or decoupage. 6. Know that a clutter-free space doesn’t have to be minimalist. Being surrounded by a jumble of colorful paint jars, brushes and stacks of fabric can be richly inspiring. If you love the feeling of being in a full creative space, go with it! Clutter-free does not necessarily equal minimalist; it simply means that everything you keep has been intentionally chosen, not kept by default. 7. Beware of black-hole bins. Opaque containers (like the ones shown here) can be wonderful for organizing materials like yarn and fabric, as long as they are clearly labeled. Otherwise, you risk falling into the black-hole organizational trap — this is what happens when you purchase a bunch of containers to “organize” your craft supplies, start filling up the bins, and promptly forget where everything is. 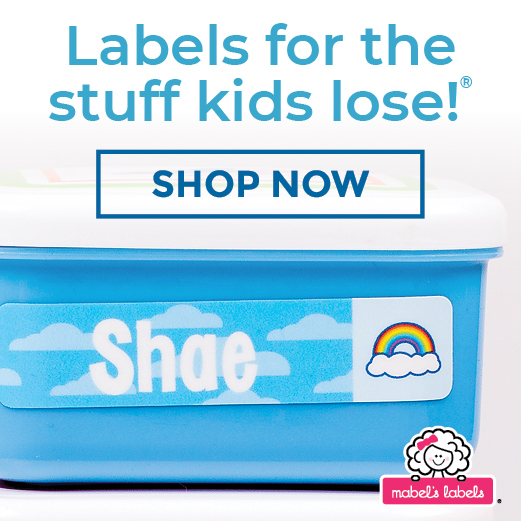 To avoid this, either use open shelves and clear containers or invest in a label maker! 8. Set a physical limit (even if you decide to scale up your craft space). One of the surest ways to prevent clutter from getting out of control is to set a physical limit on where you store your materials. For example, if you have a cabinet with two shelves for your craft supplies, when that cabinet gets full, it’s time to pare back. And if your crafting takes on a more important role in your life (or you start selling your wares), don’t allow the materials to slowly overtake your storage — scale up with intention. Pretend that you are the curator of your own craft shop: The goal should be to have a well-edited stock of inspiring materials that easily fits within the available storage. 9. Be honest when a material (or project) is a flop. If you buy a material, or start a project, and it just doesn’t work out, whatever the reason — and no matter how much money you spent on the item — it’s important to learn to let it go. If you can, you may want to pass the materials along to another crafter, donate them to a local art teacher or even sell them. 10. 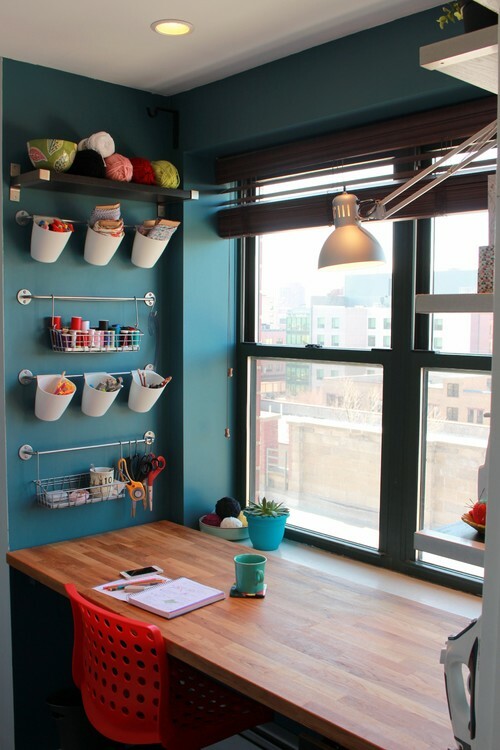 Schedule regular “studio dates” to refresh your space (and whittle your stash). Working in a clean, well-organized studio is so much more pleasant than trying to start a project when your craft area is in disarray. 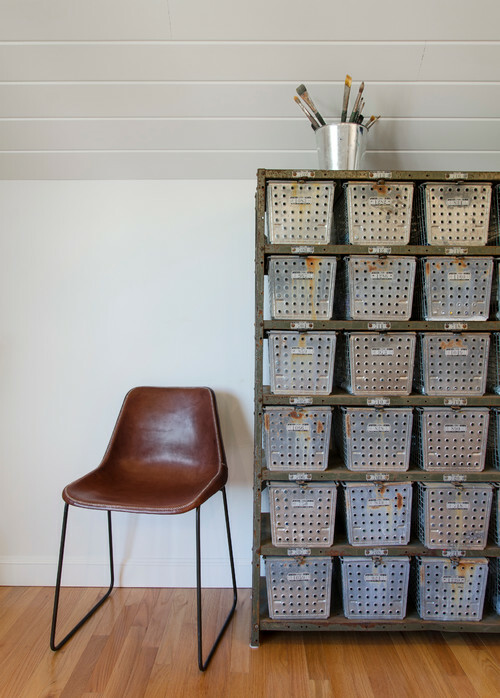 Schedule a few dates on your calendar for tidying up your studio area. 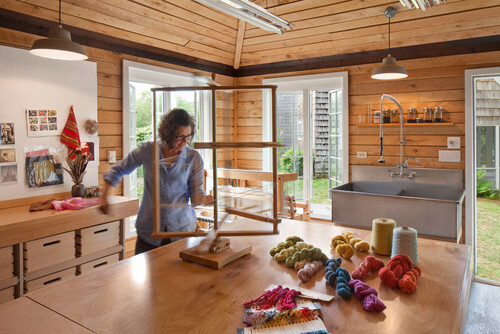 Tell us: Are you a crafter? 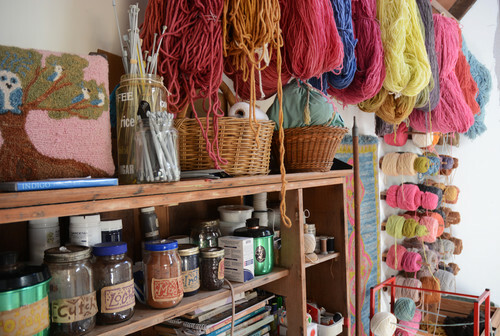 Share a photo of your craft stash in the Comments!